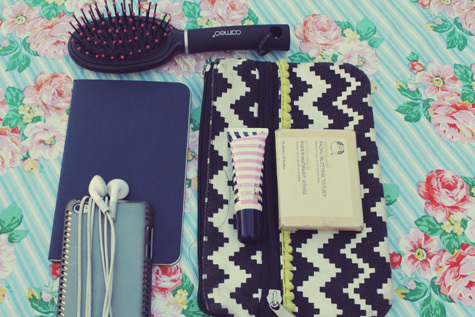 ♥ Mini Hairbrush. My hair conveniently tangles & gets windswept during the day so I always have a hairbrush handy. This brush is going to be replaced with a Tangle Teezer though as it is more compact & has a cover so that the bristles don't get caught on anything. ♥ Mini Moleskine Notebook. It isn't always practical to carry a massive notebook around with me & this is the perfect size for jotting down ideas, shopping lists & anything I want to remember really. ♥ iPod Touch. Music is essential, especially for long train trips. I'd be lost without my iPod on public transport. 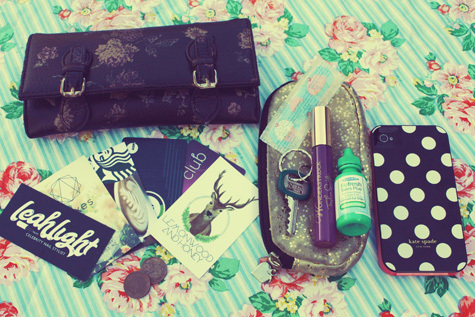 ♥ Pouch from Cotton On Body containing; MAC Lip Tint & The Body Shop Blotting Paper. I always carry a lip balm of some kind with me as my lips do get dry if I'm not careful & blotting paper is handy as I don't always carry powder with me. This little bag usually has extra makeup bits for touch ups on long days. ♥ Sunglasses from Dotti. Another necessity in my handbag. 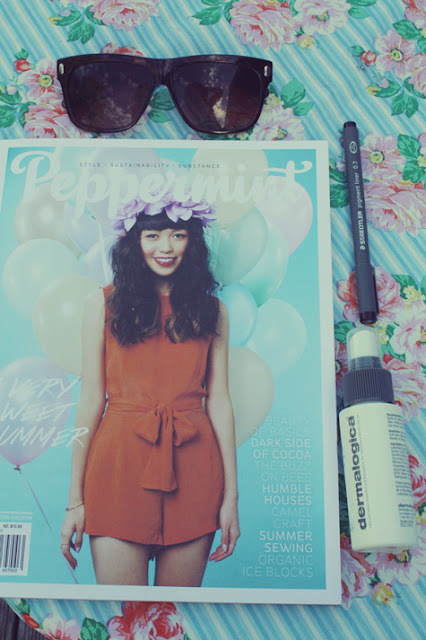 ♥ Reading material, at the moment it's Peppermint Magazine. Usually I like to take a book or magazine with me if I'm traveling for a reasonable amount of time. ♥ A pen!! This is for the notebook or to write notes etc. ♥ Dermalogica toner. This gets spritzed when I want to freshen up & give my skin a pick me up. ♥ Wallet from Urban Outfitters several years ago. My wallet contains a ton of cards, occasionally coins & often receipts which I forget to discard. ♥ Small purse from Topshop. This contains plasters, my house keys, drops for my contact lenses & a rollerball perfume. This little case is so handy & I always manage to fit a fair bit into it. ♥ Last but not least my iPhone! A necessity when I'm out & about. *So there you have it! I hope you've enjoyed this post. Next month I'm off travelling so I was thinking of doing a 'What's in my travel makeup bag' post, let me know if that's something you'd like to see. I hope your Wednesday's are wondrous. I'm having a busy week back at Summer School & I'm counting down to Friday when my classes will be finished! 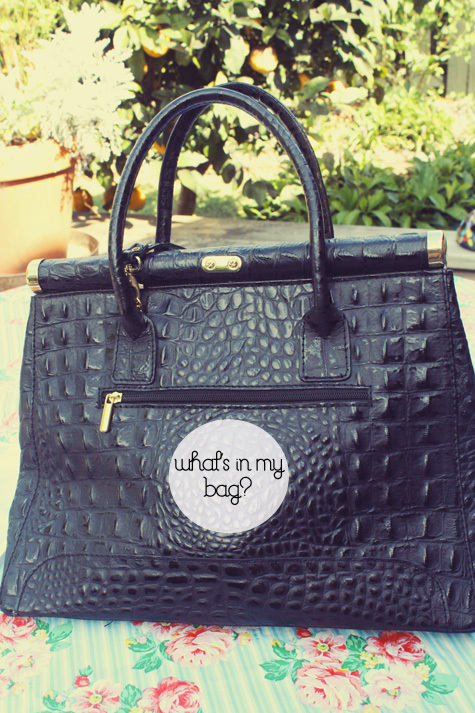 I always love reading 'What's in my bag?' posts. They are so interesting and fun to read. 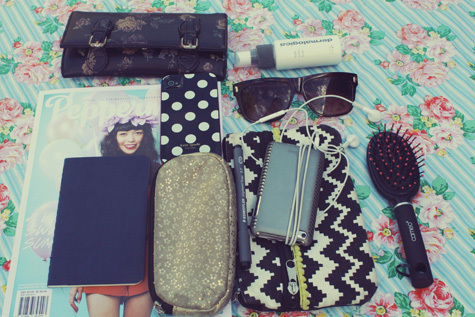 What's in your bag can actually say a lot about your personality. I like the style of your purse, it's very classy and lovely.